and when spring comes so do showers. I usually think of April as having the showers, but we have definitely been a month ahead this year. 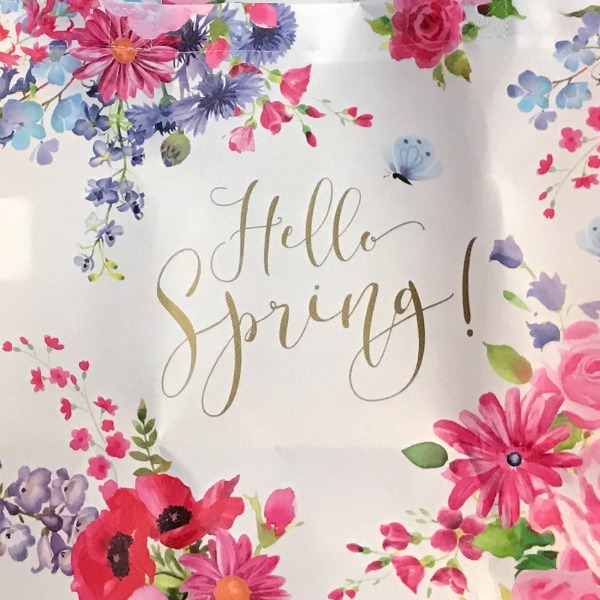 Don't you just love this sweet spring tote? I won it in a giveaway from one of my favorite bloggers, Kris at Junk Chic Cottage. 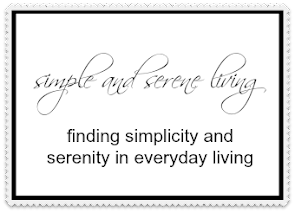 I know that most of you know Kris, but if you don't you will want to read her blog. She is on a little break right now, but go on over and read her old posts. The warm weather and all of the rain we are having is greening up our landscape and bringing back the color in the flowers and the trees. The azaleas, here in Kentucky, are beautiful this year. I was really worried about the weeping cherry trees after the hard freeze we had recently, but they have blossomed and are gorgeous. I love this view at the Lexington Cemetery. It is one of the most beautiful cemeteries I have ever been in and is where most of my family is buried. I always like to spend a little time talking to my dad when I go. He was so smart and when I am going through difficult times I miss his wisdom. Has spring arrived where you are. I see that some of you still have quite a bit of snow. I hope spring showers wash it away soon. Love the tote! Kris is so sweet. It rained pretty hard here all night. It really stormed here last night and dropped out temps. I'm ready for warm weather to last. The blooms are really popping here in Georgia this week! Love the tote, so cute. Kris is a wonderful blogger. Enjoy your day! Hugs! Kris is such a sweetie. 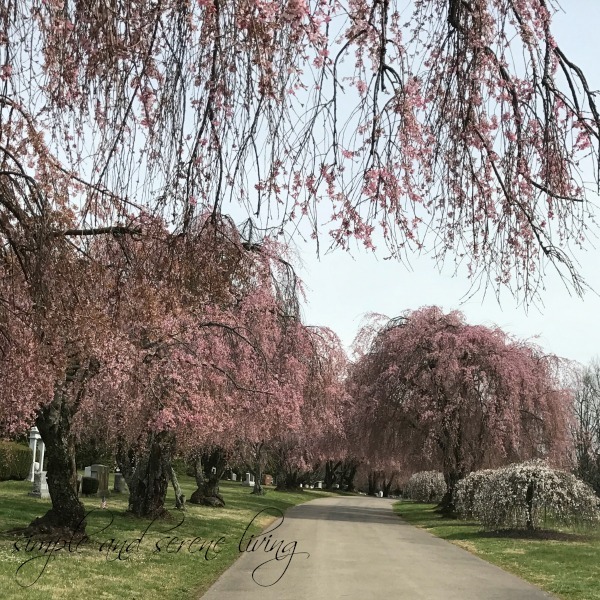 Lovely photos, the weeping cherry trees are gorgeous! Still snow here in NH(though I can see some bare ground in my back yard) and expecting more snow Friday and Saturday. This time of year though, it melts fairly quickly. I sure hope your snow ends soon, Linda. I am not a winter person, so I will be glad when the weather warms up for good. What a pretty tote and congrats on being the winner of it! Lovely photos. No sign of April showers around here, we're trying to get the last of the snow melted. Rain would be lovely. Pretty severe storms last night and gloomy skies today. It is very typical March weather right now with up and down temps. Hope your snow melts soon. Kris is wonderful. Hope you get some warm weather soon. Diana. Here in central KY our fruit trees are just starting to blossom. Your pictures are just beautiful!! What a beautiful color your azalea is and I love those weeping cherry trees. I was a winner of one of those lovely totes as well and mine is holding yarn for a project or two that I am working on. 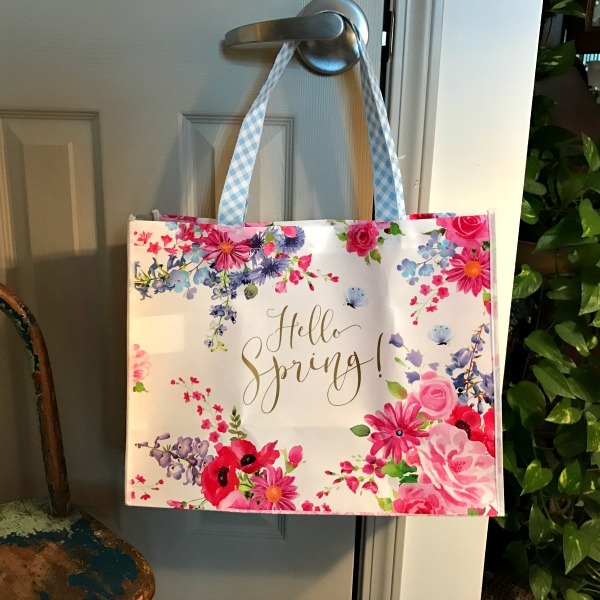 I haven't decided what to do with my tote, so it is hanging on my doorknob where it is cheering me up. Thanks, Magali. I love spring. Glad you got your tote. Let's hope it brings on Spring. I love it, Kris. It is definitely cheery. That is a beautiful tote! I'm happy that you won. 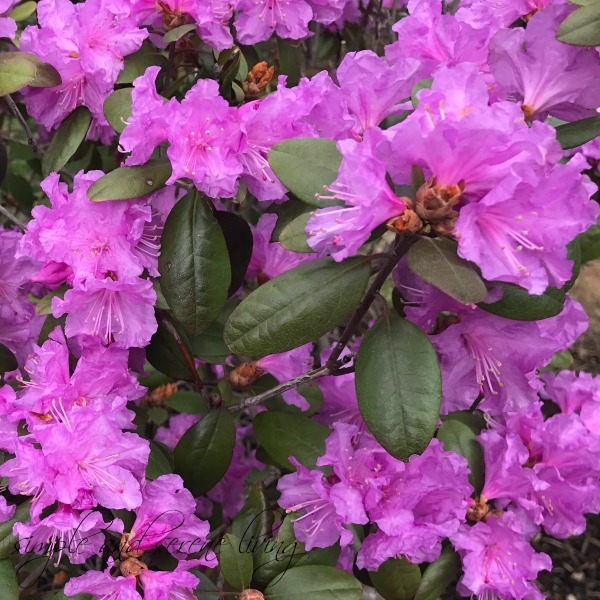 Love the azaleas...I always wish the spring flowers could bloom all summer, too. Have a nice weekend! It sounds like such a strange thing to say, but it looks like a beautiful place to be buried. The trees are gorgeous!